The original block of this luxury hotel is a heritage property which was constructed in 1905. There is another block known as the Annexe wing which was added later and has three floors. The heritage block has been restored to its original grandeur reflecting the colonial era almost at all sections of the block. 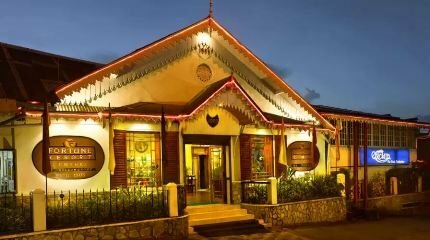 The annexe wing is located across the road and the rooms there also have been designed to keep a harmony with the heritage wing. The resort is located centrally right at the market area. The location can't get any more central. The mall (chowrasta) is only 4-5 minute walk, shops, taxi stand and great restaurants like Glenarys etc are all within easy walking distance. The resort was earlier run by the Fortune group for about 10 years when it was known as Fortune Resort Central. Later the name was changed. There are four types of rooms in the hotel. The Standard and the Deluxe rooms are located at the Annexe building. If you want views of Mt. 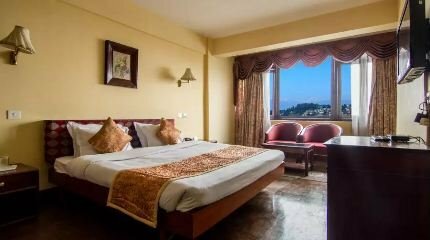 Kanchenjunga directly from your room, then you must book a Deluxe room. No other type of room including the ones at the Heritage block has views of the mountains and the snow peaks. You can only see the road from the Standard rooms in Annex and the backside of some buildings from the rooms at Heritage block. There are total of 46 rooms in the resort. The Heritage block has large and spacious rooms called the Heritage Club rooms and also a Heritage Suite which has an additional living room. 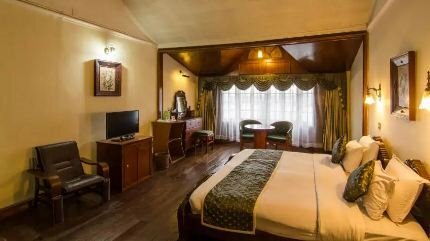 The heritage rooms and suite retain the original British Raj aura with extensive wood work, antique furnishing, fireplace, paintings etc. Each Heritage Club room is over 500 sq. ft. in size. However the bathrooms in the Heritage Club rooms are disappointing, particularly when you look at the tiling of the bathroom floor which is mostly unimpressive marble. This is perhaps to retain the original tiling style of the period, but you may not always enjoy original features if they don't blend with the expected luxury level. The lower level rooms in the heritage block have sit out areas, but you need to negotiate stairs to get to the lobby level. Most rooms of both the blocks have wooden floors, wardrobe & study desk, complimentary wifi, tea & coffee maker, complimentary bottled water, DVD player, room heater, toiletries etc. An additional feature in all rooms (quite handy in winter) is electrical bed warmer. There is no elevator in the hotel in either block. The main entrance at Annexe block is locked at night. So if you have plans to get out early in the morning, tell them in advance. The hotel has two multi-cuisine restaurants and one of them has a bar. There is also a separate bar lounge with a designated smoking area. You get nice views from the bar lounge. There is happy hour in the evening when you get liquor at discounted rates. The breakfast spread is very impressive. Lunch and dinner menu are okay, but nothing special. In fact they often offer buffet during lunch and dinner as well, and if you try to order for ala carte, they will subtly try to push the dishes already made available at the buffet so that they don't need to cook afresh. But if you insist on some new dish that you like in the menu, they will oblige. The pianist playing piano during dinner ads to the charm in the dining room. The staff are quite friendly and courteous. However the service level can get poor at times during high demand, particularly at the Annexe wing. The housekeeping is meticulous. Other amenities include a play area for children, games room including table tennis, travel & tour desk, library which also has collection of kids books, meeting room, banquet etc. The in-house Spa and wellness center offers a range of massages and skin treatment. Overall a nice hotel but a tad overpriced in my opinion.